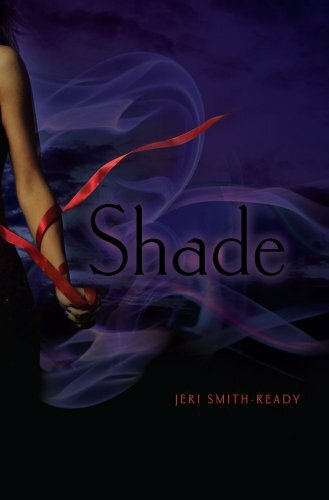 The Compulsive Reader: Shade by Jeri Smith-Ready: Read It and Win It! Aura is a part of the first generation born after the Shift, which gave everyone born into the world the ability to see and speak with ghosts. She's never liked her ability, but can't deny being curious about what caused the Shift to occur, and harbors hopes that one day it can be undone. But when her boyfriend Logan dies unexpectedly and Aura is beside herself. Her ability is the only thing that gives her comfort, and allows her to still communicate with Logan. Then she meets Zachary, a mysterious boy with more than a few secrets that Aura is dying to know about, and together they find that their pasts have far too many common factors to be written off as coincidence...bringing Aura closer than she can imagine to the truth about the Shift. Shade is an unconventional and tension-filled read. Smith-Ready's fascinating world in which everyone under the age of seventeen can see and hear ghosts will draw readers in, and Aura's strong voice and her conflicting feelings over Logan and Zachary will have them falling in love with Shade. The concept of the Shift is inventive and perhaps the most appealing aspect of the book, though Aura's personable and realistic voice is very well written, from her anguish over Logan's death and her intense curiosity over the truth about the Shift to her growing feelings for Zachary. Smith-Ready steadily builds suspense throughout the book as Zachary and Aura search for answers and confront the obstacles that stand in their way. However, partway through the book, it feels as if the momentum of their search is thrown off track as Aura becomes involved in finding a way to help Logan move on to the afterlife. This detour is not completely unwelcome though; plenty of romantic tension is built, Aura must face some tough decisions, and evens appear to develop some interesting new abilities in her pursuit to keep Logan from turning shade. Shade has a very open ending that demands a sequel, in which we hopefully will learn more about Aura's past, the specifics of turning "shade", and how she and Zachary and Logan are involved in the Shift. Shade is a smart, and even at times philosophical, paranormal read that is as thrilling as it is romantic. Cover Comments: I like this cover a lot. Purple and red are a striking combination, and I love the red ribbon. The cover is the perfect balance between beautiful and ominous. Shade will be available tomorrow, May 4th! Thanks to the generosity of Simon and Schuster, I will be giving away five copies of Shade! All you have to do is fill out the form below! This contest will run until May 17th, 2010! Also, in case you missed it, don't forget to check out the fabulous trailer! The trailer is pretty great! I am definitely looking forward to reading this! Thanks for the contests, can't wait to read Shade! Very cool contest, I really want to read this one! Thanks for the awesome contest! I am dying to read this one! Hi, I would like to enter..but is it international?